Happy New Year - I can't believe we are at the beginning of a new year already and the start of a new challenge! This month the design team will be using a variety of older High Hopes stamps - it will be something different every day! Fun right?! Our challenge this month is Anything Goes ....with a twist - well a couple actually Use purple/blue and a ribbon or button. Such a fun way to start the new year! I get to use "Gabby" and decided that I wanted to use some bright, fun colours! I am playing along with the challenge twist by using blue and twine (shh don't tell the boss I cheated a little ). After colouring up cute Gabby with her watering can, I hand fussy cut her and went around the edges with a black marker. 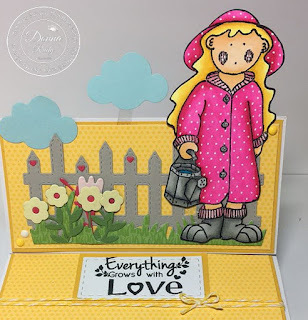 I formed my easel card base and added some bright polka dot paper from Doodlebug. The scene was made with variety of dies - the list is below. The sentiment is stamped and mounted on cardstock and is strategically placed to help as a "stopper" for my easel card. Some twine and gumdrops finish off my card. Don't forget to ink up your favourite High Hopes stamp and come play along in our Anything Goes - with a twist challenge! Ahhh, Gabby is so sweet! Love the fun bright colours and the scene you created!! Another awesome design by you!! Gabby is so adorable Donna! Love the bright colours and the scene you created. So cute. First stamps I saw like these. I need to learn how to make an easel card. Thanks for sharing.